Everyone has experienced some type of bad breath – whether it was from eating garlic bread or onion rings, drinking coffee or wine, or just waking up with it. While those types of bad breath are short lived and usually "cured" with a good tooth brushing and/or mouthwash, many people suffer from chronic bad breath known as halitosis. Halitosis is caused by rotting inside the mouth. Gross, right? When food particles from inherently stinky foods are trapped between the teeth and not removed by regular flossing, they will begin to rot inside the mouth and cause very bad breath. Smoking, dry mouth, respiratory infections and acid reflux are also culprits of halitosis. Lawrenceville Family Dental Care offers professional and effective treatment for halitosis. Toothpaste and mouthwash will only mask the smell of chronic bad breath for a short time, so it is imperative that you seek professional treatment for halitosis. Dr. Ashish Patel understands that this can be a serious dental concern, both for your oral health and your personal life, and he is here to help you overcome halitosis with general dental care. Chronic bad breath is typically not cured without professional intervention. At Lawrenceville Family Dental Care, we offer successful treatment for bad breath. We can also make suggestions to improve your dietary and lifestyle choices to prevent bad breath from reoccurring in the future. The simple act of decreasing your sugar intake can improve your breath. Bacteria found in the mouth are especially drawn to sugars, and where sugar is found inside your mouth is where the highest number of bacteria will accumulate. A deep cleaning of the teeth and gums is typically your first step in the treatment for bad breath. Removing any rotting food particles and excess bacteria-laden plaque is the first step for cleaning out the mouth. Dr. Patel delivers expert treatment for bad breath and will help make this issue a thing of the past. 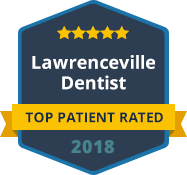 Please contact Lawrenceville Family Dental Care today to schedule an appointment for treatment of bad breath.